As a featured debate article in ROLSI vol 51(1), I invited Leelo Keevallik to showcase her argument that traditional conceptions of grammar needed to change: to take the body, and its deployment in the unfolding of turns, seriously. I’m delighted that she also accepted an invitation to write a guest blog, reflecting on how she came to this challenging, and tantalising, new conception. My training as a linguist started behind the Iron Curtain according to a very traditional philological curriculum and no course literature in English. But I was fascinated by the neat grammatical paradigms, the prudent morphology tables, and the precise categorizations of parts-of-speech. The first revelation that language had to do something with real life came with a thick green book called Directions in Sociolinguistics (ed. by John Gumperz & John Dell Hymes) that was brought to Tartu by a fellow student after a term abroad. It read like a good collection of short stories. William Labov’s variationist method made a special impression on me, and my first grant was for a project to record every inhabitant on a small island. The speakers had to sit down close to a tape recorder and talk for as long as possible. We would even help them to get some urgent farm work done so that they would have spare time for us. It was exciting to study language variation in relation to social parameters. Indeed, young boys hoping to become fishermen sounded more like their parents than the young girls planning to educate themselves on the mainland. Twenty years later I returned to the island, this time not to force the people to sit down with me but to video record their working together, going about their everyday business. I am still interested in language, but only as it makes sense in relation to action, collaboration, and embodied behavior. The entire backdrop of my research has changed dramatically since I learned how to deal with the complexities of real-time face-to-face interaction and discover social order in it. Many of my favorite professional moments occur at data sessions with close colleagues in Linköping, while scrutinizing a few seconds of video-recorded conversation. Once in a while, though, I miss explicit discussions on the difference a prefix vs. suffix, or ergative vs. nominative-accusative syntax makes. 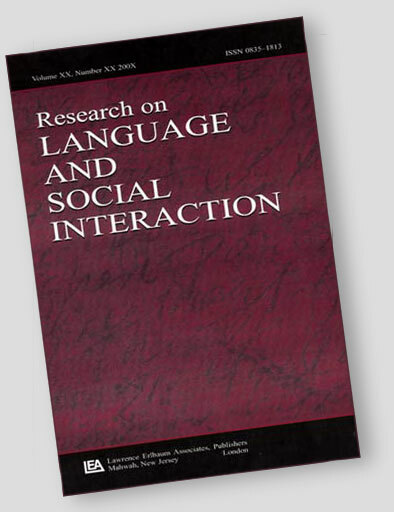 The recent paper in ROLSI reconciles my interests in both the routinized and the occasioned, the verbal and the embodied, and is an attempt to talk to a broader circle of linguists about real-life interaction. If you take the time to record actual behaviour, and scrutinise it carefully, leaving preconceptions about grammar to one side, you will find that people actually complete their clauses with embodied demonstrations and continue building syntactic structures after them. We can in fact choose to add a relative clause, or maybe even a comparative suffix as an immediate reaction to what the others are currently doing – or not doing, such as not yet straightening their spines enough in a Pilates class. The figures below show the progression of the utterance. While targeting embodied interaction the paper still treasures linguistic diversity. Some of the patterns are illustrated in Estonian, one of the smallest languages ever analyzed on the pages of this journal . Realising the range of languages that we have collectively worked on without ignoring the body was one of the most gratifying aspects of taking stock of the current research situation. Another one was to be able to pull together threads from such a huge number of studies, even though the final text had to be a balancing act between them. And it was a particular pleasure and honour to have my ideas worked through, and taken yet further by two eminent scholars, Elizabeth Couper-Kuhlen and Jürgen Streeck. I hope readers of this blog will have the time and inclination to follow up the whole debate in ROLSI.